Dog Sled Racing: Sport, Spectacle Or Exploitation? The fact that I am ashamed to admit that I have participated in dog sledding is some indication of my moral position: I feel a pretty high level of moral discomfort, but am not quite prepared for blanket condemnation. I will say this: having done it once, I wouldn't do it again. I will admit right up front that it was really exciting, flying along through the snow in back of this amazingly coordinated team of dogs. But when all was said and done, the moral yuck factor was moderate to high. Dog sledding is not something I would have ordinarily done, being the kind of person who thinks that our dogs should sleep in the bed with us and eat home-cooked meals. But my daughter was obsessed with dog sledding. She watched the movie Balto (about the original sled dog team bringing diphtheria medicine to Nome, Alaska) at least a million times and read every book she could find about huskies and dog sledding. She had our two dogs hooked up to our Radio Flyer sled whenever our Colorado town had enough snow on the ground. One year we gave her an early birthday present of a "real" dog sledding experience, up in Steamboat Springs. We met the dog musher and his team of dogs in the morning, at the specified location. When we arrived, the dogs were still in the truck -- specially designed with rows of stacked cubicles for the dogs. One by one, the dog musher opened the doors of the small cages and lifted out the dogs, attaching them by tether to the truck until he was ready to harness them. 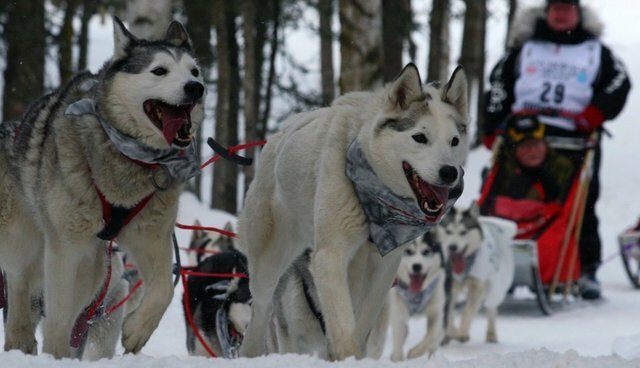 My first impression of the dogs: they were very skinny and a bit dirty, and I wondered how they would have the energy to pull 4 people through the snow. And they were hyped up. (The word that came to my mind at the time was "manic.") They barked and howled and jumped around as the musher showed us how the harness system worked and directed us to take one dog and then another and hook them up. The musher knew each dog's individual quirks, and treated them with restraint -- though these were very clearly not his pets. When we finally circled back around to the car, about 2 hours later, the dogs were tired and calm. The first thing the musher did was unharness all the dogs and serve them up some warm kibble soup, which made me feel good. Then he loaded them back up in their tiny metal cubicles, which made me feel bad again. When we got back home after the weekend away, I started reading about dog sledding, particularly the concerns of animal advocates who consider it abusive and cruel (PETA is opposed to all dog sledding, and calls the Iditarod "death on the trail," a "barbaric ritual"), and I found myself largely convinced. However, I don't think that the pampered pet should be our model for appropriate human-dog relationships. Working relationships between human and canine and be powerful and respectful, as can sporting partnerships (like skijoring), which can be fun and exciting for dog and human alike. But putting dogs in situations where they are asked (okay, not "asked" but forced) to perform grueling and dangerous work -- and where the benefit for humans is not the delivery of life-saving medicine but fun, excitement, status, or prize money -- feels like exploitation.